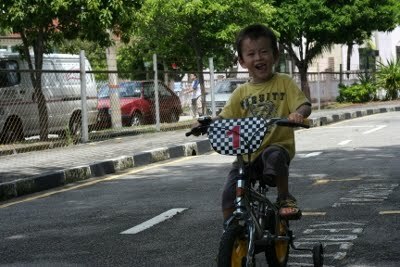 It's about 5 minute drive from here to get to the traffic garden (Taman Lalu Lintas) in Penang. It's one of the usual Malaysian parks, where people are doing exercises or resting, but there are cycling roads and miniature traffic signs. 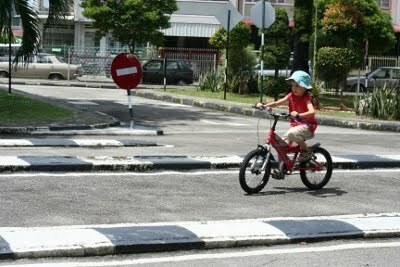 It's a perfect place for kids to get on bike. Annika invited us to the gathering there and as the weather was not good on that day, I decided to go. (If weather is too good, I don't want to go...) She told me her friends and kids, mainly German, gather there nearly every Wednesday late afternoon. It's better than I expected. There are lots of shades and kids enjoy cycling. They have a small climbing frame and a slide. After cycling, we usually have a picnic under a big tree.